Is mise Nóirín Bairéad agus tá mé nua-fhostaithe mar Oifigeach Forbartha do Bhaile Átha Cliath le Glór na nGael. Ba mhaith liom mé féin a chur in aithne duit agus na deiseanna agus na tacaíochta éagsúla atá ar fáil do chlubanna CLG don Gaeilge a chur chun cinn agus í a fhorbairt. Iarrfar ar na clubanna CLG páirt a ghlacadh sa Turas Teanga 2015. Ní ghá ach clárú linn agus tiomantas a léiriú ar son fhorbairt na Gaeilge de, le cúnamh ó Ghlór na nGael & Coiste Naisiúnta na Gaeilge. Téann gach club a chláraíonn linn le haghaidh Turas Teanga 2015 isteach i gcomórtas le duais-ciste ar luach €15000 le buachan. Chomh maith leis sin tá pacáiste tacaíochta ar luach €50 ar fáil do gach club le treoir agus tacaíocht ar fáil óna hOifigigh Forbartha Ghlór na nGael chomh maith. Faoi láthair, táimid i lár tionscnamh a fhorbairt ag díriú ar scéim comhmhaoiniú a chruthú idir an chlub, Páirc an Chrócaigh agus Glór na nGael mar bhreis thacaíocht do gníomhachtaí Gaeilge amháin sa chlub. Iniata leis an ríomphost seo tá cóip dár mbróisiúr Turas Teanga, agus an fhoirm iarratais leis. Tabhair faoi deara go bhfuil táille cláraithe €30 ann. Má bhíonn aon cheist agat nó breis eolas uait, bhéinn lán sásta cruinniú gairid a shocrú leat ar do chaoithiúlacht nó leis an Oifigeach Gaeilge má bhíonn duine ar bith agaibh ag obair ar son na Gaeilge de. My name is Nóirín Bairéad and I have been recently appointed as Development Officer for Dublin with the Irish language organisation Glór na nGael. I would like to formally introduce myself while making you aware of the supports and opportunities available to GAA clubs for the promotion and development of the Irish language. 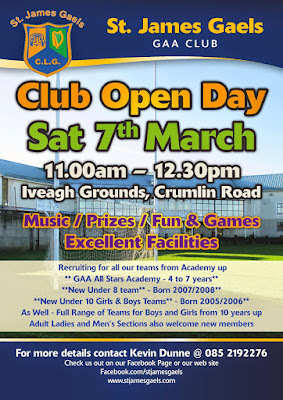 We are asking clubs to join us for Turas Teanga 2015. This simply means, registering your club and making a commitment to developing inititatives which will promote and encourage the use of the Irish language. Upon registration, each club will receive an Irish language support package from Glór na nGael to the value of €50 and will automatically be entered into our national competition which includes a prize fund worth €15,000. 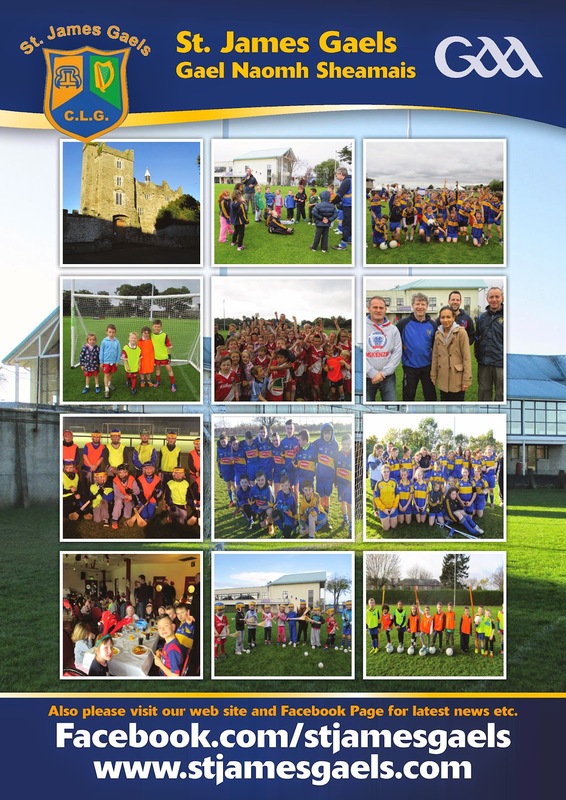 We are also currently in the process of developing an initiative which aims to strengthen the supports available for Irish language events within the club through a match-funding scheme between the club, Glór na nGael and Croke Park. Please find attached a copy of our Turas Teanga brochure which includes the application form. Please note there is a €30 registration fee. If you have any questions or would like to discuss all of the above further, I would be more than happy to arrange a brief meeting with you or the club's Irish Officer at a time and date that is convenient for you. The Dublin Senior Football Team will play their 3 National League Home Games in Croke Park with one Double header with the Senior Hurlers on Saturday 7th March. Juveniles (U16) €3, One adult will be admitted free of charge with every ten juveniles. Each additional adult ticket - €10. Please send your ticket order to cluborders@dublingaa.ie by 10am on Monday 2nd February in the same format as the sample below. Tickets will be available for collection from the GAA Ticket Office, Dorset Street from 10am on Wednesday 4thFebruary. We look forward to working with you again in 2015. On the evening of 20 June I learned that Eamonn Lane had passed away during April. I came to know Eamonn through his involvement with An Caisleáin and it was through my attendance at a meeting of long retired players that I learned of his passing. Eamonn was, to me, a thorough gentleman and one of those unsung heroes who made life so much better for all of us without ever needing any credit or admiration for doing so. I first came across him when I was, I think, eleven or so when he was my coach in both hurling and football up in the fields by Drimnagh Castle. He was absolutely superb in his encouragement of the players in his care. His boundless patience, endless enthusiasm with his quiet and personal attention to each individual ensured that, not only did he have children who wanted to play for him, he had children who loved playing for him. Children wanted to do well for him and the team and, as a result, his teams were successful. Ironic as it may seem now with my job as a Trade Union Official, my first “strike” was in support of Eamonn Lane. For reasons which remain a mystery, the Club Executive felt he should be assisted or replaced (I cannot remember which) as our team mentor. We were having none of it and refused to play until our Mr Lane was back in charge. It was only many years later that I learned of his own work and involvement as a Trade Union representative for what is now SIPTU. In these days of text and internet messaging, people forget that “in charge” meant driving around Walkinstown two or three nights a week delivering cards to homes to let players know when the next match or training session was on. Following my premature retirement from the fields of An Caisleáin, I believed I was more or less finished with the club. This all changed in the car park of the Greenhills Shopping Centre some time in 1995 or so when I met Mr Lane. He told me that he was running a bit of a nursery in the Club and asked me if I would come down to help him out. Having had no contact with the Club for many years my instant instinct was to say no. Then I took one more look at Eamonn, recalled him as the person who had looked after me and contemplated how amazing it was, to me anyway, that he was still involved. And I told him I would give it a try. One year later, I think, he handed responsibility for his nursery to me and thus began an extended period of commitment to the Club which carried on the great work of Eamonn Lane. Whenever I have been asked how I became involved again I always reference Mr Lane, one of the greatest servants our Club ever had, perhaps without even knowing it himself. I am truly sorry Mr Lane has died. I am also so grateful to have known him. I was privileged to learn my limited skills as a player from him but, more importantly, I was really privileged, because of his persuasion, to learn of the immense pleasure and enjoyment which can be gained from giving Gaelic games to other children. As the Lane family come to terms with their loss I sincerely hope that the real affection felt by me and others for “our Eamonn” will give them a degree of comfort and consolation. Eamonn gave more to the world than most and I, for one, feel it is a seriously poorer place for his passing. At times it may have seemed that the intercession of their own Saint was necessary, but in the end St Jude’s needed to look no further than their own super star Kevin Mc Manamon for the inspiration needed to drive on to victory over a very strong Thomas Davis outfit in the annual John Humphrey memorial cup hosted by St James Gaels in the Iveagh Grounds on the Crumlin Road on 28 December. Trailing by 1-4 to 0-3 at half time the boys from St Jude’s fought with a dogged determination in the second half to run out eventual winners on a score of 1-7 to 1-6. The weather was cold and crisp in in the Iveagh Grounds in Crumlin and so was the football. In the end St Jude’s edged a pulsating final by the narrowest of margins following a much discussed incident during the second half. With less than ten minutes to the finish, and with Judes trailing by four points, they smashed the ball against the Thomas Davis crossbar to sighs of relief from the Kiltipper contingent. However, shortly after the boys from Tallaght had cleared their lines St Judes were back on the offensive. The ball was expertly driven to the Thomas Davis net but the referee had already called play back to award a penalty to the Templeogue outfit for a foul on their sharp shooter. Cool as a breeze the penalty was slotted home and this was followed shortly afterwards by an ace of a score from the side line which crossed over for a point hitting both the upright and cross bar on the way. Jude’s had to weather some extreme pressure from the Tallaght boys at the finish and one fisted effort in particular came very close to claiming the title for Thomas Davis. In the end the lively St Jude’s side held out for a one point victory on a score line of 1-7 to 1-6. 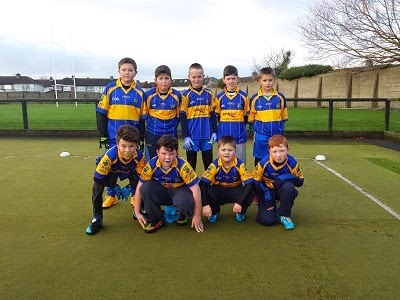 Played on 27 December and 28 December, the competition is held in memory of young John Humphrey, a St James Gaels player, who died tragically in an accident in 1998. This was the 16th year of the competition and, as always, the spirit in which the competition was played, and the high standard of football, was a fitting memorial to the memory of young John Humphrey. Generously sponsored by John’s family, the tournament showcases the cream of under 10 talent in Dublin football. The group stages on Saturday saw St Judes’s, Cuala, Thomas Davis & Castleknock advance to the final stages at the expense of hosts St. James Gaels, Templeogue Synge Street, St Annes and Whitehall Colmcilles. As always, the standard of football throughout the tournament was excellent and there was no shortage of thrills over the two days. By the time the final whistle was blown by referee Conor Dunne (St. James Gaels) on the last of the games, all of the spectators were delighted having witnessed some thrilling games with no end of goalmouth incident. Dubs Star Kevin Mc Manamon was on hand, not only celebrate the success of his own Club in the final, but also to point out what a truly special tournament the Humphrey Cup is for the family of John Humphrey and all of their friends in St James Gaels. Speaking at the presentation of the trophy to St Jude’s, Billy Hannigan, of St James Gaels, paid tribute to all of the players and their mentors who had made the event such a success. He paid a special tribute to Gaels Paul Flanagan who is the driving force behind the competition and to everyone else who helped out in any way. Billy stressed the importance to St James Gaels of the continued success of the tournament and reminded everyone present just how important team sport is to the development of our young people. Cuan Manning from St Jude’s was the recipient of the award for the player of the tournament but he certainly had hot competition from a number of others. The recipient of the award for best endeavour went to Luke Pettit from Castleknock whose dogged persistent determination earned him many admirers in the Iveagh Grounds. Crumlin Hospital stands to make some €1,000 from the competing teams. Every year a similar sum is raised by the competition to assist the children’s hospital. Finally mention needs to be made of Aaron Byrne, Conor Dunne and Dean Byrne of St James Gaels who did an excellent job as referees throughout the tournament. At its awards night on 4 December St James Gaels were delighted to welcome Dublin star Kevin Mc Manamon as their guest of honour. 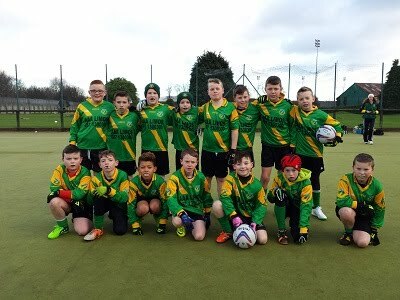 On 27 and 28 December next the Dublin ace’s club mates from the St Jude’s Under 10 football team will be amongst the teams battling for glory at the home of St James Gaels. Most Dubliners prepare for Christmas by shopping but down in the Iveagh Grounds St James Gaels prepare to have a feast of Christmas football. Over the Christmas weekend the Gael’s home on the Crumlin Road will showcase the cream of under 10 talent in Dublin football in the annual John Humphrey memorial cup hosted by St James Gaels. The Gaels have organised over 20 Gaelic football fixtures in their annual competition. Under 10 footballers from Bohernabreena, Foxrock, Whitehall, Crumlin, Castleknock, Marino, Templeogue, Kiltipper and Lucan will showcase their talents in Dublin football in the annual John Humphrey memorial cup hosted by St James Gaels. The competition is held in memory of John Humphrey, a young St James Gaels player, who died tragically in 1998. Generously sponsored by John’s family the tournament is a fitting tribute to the memory of a young boy for whom sport played such a major part in his short life. Television will, no doubt, offer some form of sporting offerings on 27 and 28 December. St James Gaels will offer sport in its truest sense - played for the thrill and enjoyment of participation, in the memory of a sports loving child, and in aid of the Children’s Hospital in Crumlin. Yes, you can watch television but why not join us in watching real sporting prowess in action. Group A : St. James Gaels v Castleknock 10.30a.m. - 10.25a.m. St. Anne’s v Cuala 10.30a.m. - 10.55a.m. St. Anne’s v St. James Gaels 11.00a.m. - 11.25a.m. Whitehall Colmchilles v Cuala 11.00a.m. - 11.25a.m. Cuala v St. James Gaels 11.30a.m. - 11.55a.m. Castleknock v Whitehall Colmchilles 11.30a.m. - 11.55a.m. Whitehall Colmchilles v St. Anne’s 12.00p.m. - 12.25p.m. Cuala v Castleknock 12.00p.m. - 12.25p.m. St. James Gaels v Whitehall Colmchilles 12.30p.m. - 12.55p.m. St. Anne’s v Castleknock 12.30p.m. - 12.55p.m. Group B : St. Vincent’s v Templeogue/Synge Street 02.00p.m. - 02.25p.m. St. Jude’s v Thomas Davis 02.00p.m. - 02.25p.m. St. Jude’s v St. Vincent’s 02.30p.m. - 02.55p.m. Lucan Sarsfields v Thomas Davis 02.30p.m. - 02.55p.m. Thomas Davis v St. Vincent’s 03.00p.m. - 03.25p.m. Templeogue/Synge Street v Lucan Sarsfields 03.00p.m. - 03.25p.m. Lucan Sarsfields v St. Jude’s 03.30p.m. - 03.55p.m. Thomas Davis v Templeogue/Synge Street 03.30p.m. - 03.55p.m. St. Vincent’s v Lucan Sarsfields 04.00p.m. - 04.25p.m. Templeogue/Synge Street v St. Judes 04.00p.m. - 04.25p.m. Winners (Group A) v Runners-Up (Group B) 02.00p.m. - 02.30p.m. Winners (Group B) v Runners-Up (Group A) 02.00p.m. - 02.30p.m. Play-off For Third/Fourth Place: 02.40p.m. - 03.10p.m. Presentation party to be held directly after Play-off final in Function Room (First Floor-Main Pavillion). Registration will take place this Saturday 16th August between 11am-12pm. Club End Of Summer day trip on Saturday 22nd Aug and family fun day on Saturday 23rd Aug. €25 per child, additional kids from same family €20. All welcome and parent participation expected. Right folks, here we go again! St. James Gaels GAA Club CUL Camp will start on the 14th of July and run till the 18th. You can book through any of the coaches. You're also able to book online at a discount. St James Gaels announces an “ Eight Week Introduction to Gaelic Football for boys and girls aged 4 to 8 years of age” starting on the 10th May and running until the 28th June. 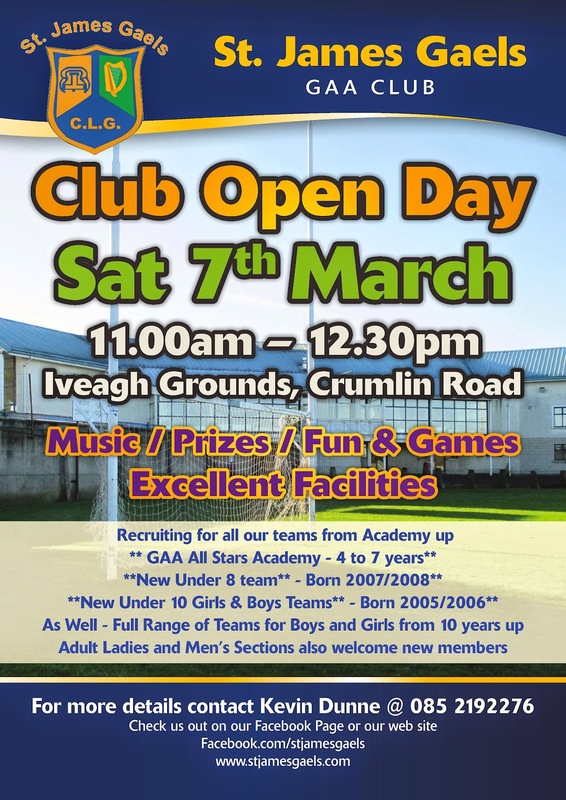 This is totally free of charge and is aimed at giving children a chance to try out Gaelic Football without having to make a full commitment. St James Gaels is based in the Iveagh Grounds on Crumlin Road and is dedicated to providing Gaelic Football activities to the Dublin South Central area and beyond. We are offering this eight week course as we believe that it will give children and their parents an opportunity to try out Gaelic Football as one of the chosen sports. All our mentors are fully trained and Garda vetted and are committed to the GAA philosophy of providing Gaelic activities in a fun and safe environment.